On Tuesday my sweet friends, Lori & Jenn, sent me this beautiful bouquet of get-well flowers . . . isn't it gorgeous? The eucalyptus branches are bent into the shape of a heart! Thanks again for your wonderful friendships and for thinking of me girls . . . these really did cheer me up on a very bad pain day! Check back in a bit later today, when I'll start 7 days of celebrating my one year anniversary of blogging! To show my appreciation of all your support over the past year, I'll be giving away a gift prize each day for a whole week!! There'll be lots of wonderful product from some of my favorite vendors and manufacturers for whom I design . . . you don't want to miss it!! First of all, I'd like to apologize for my lack of artwork being posted recently. I've been busy creating samples for the upcoming Craft & Hobby Association show which is Feb 10-13 (what fun!) and will be able to share those with you, once the show is over on February 14. Another reason is that I've been moving very slowly this week is that I spent 4 hours Saturday night in the emergency room finding out I have a superficial blood clot in my leg. Thank goodness, if you're going to have a blood clot the superficial kind is the "better" one to have (no medical danger), but extremely painful nonetheless. So until it gets better (which I'm told could be 2-6 weeks), you may not see as much artwork from me. I still hope to have some fun later this week, celebrating my one year anniversary of blogging though! 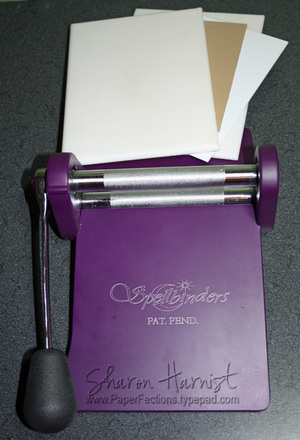 The Wizard Embossing and Die Cutting System. I've named him Harry (as in Harry Potter, who is a wizard -- get it?) He may not Cuttle, but he's a lot more powerful and easy to use than my last boyfriend!! 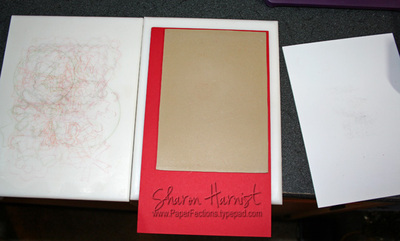 White Mat, White Spacer Plate, Die (rough side up -- mine is under the red cardstock and you can barely see the cut I've already made), Paper, White Mat on top (mine is laying to the left and yes, yours will look like this, too, with use). Run through the Wizard. What I've noticed with the Wizard's cutting mats vs. the Cuttlebug's acrylic plates, is that the dies don't stick as badly (if at all) into the Wizard's mat. I used to have to pry some of my Spellbinders dies out of the Cuttlebug's acrylic plate with a knife (have you been there and done that?)!! Then to emboss, there's one simple step. 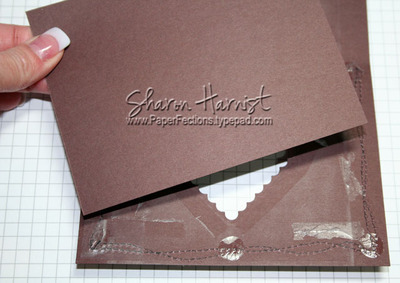 Slip your White Spacer Plate out from under your die (mine is off to the right in the photo), and place the Tan Polymer Embossing Pad on top of your cardstock -- that's it! The paper and die are still underneath the tan pad, exactly as they were when you were cutting and you always use the same two White Mats on the top and bottom of your sandwich. No worries, though -- the die will not cut through your tan pad (another question I get asked quite often). Then place the other White Mat on top of the tan pad and run through the Wizard again. I will say -- I have noticed a nicer, deeper embossing with the Wizard than I was getting with the Cuttlebug. I'm sure that has to do with the 3,000-something pounds of pressure (I'm trying to find my exact details on that figure and when I do, I'll be back to edit) the Wizard exerts! That's it -- easy peasy, isn't it?! And remember, the Wizard is a universal machine, which means you can use any manufacturer's dies in it. It's an all-metal construction, which means it's virtually indestructible, but yet very lightweight. You can also emboss with brass stencils (think of the hours you'll save hunched over a light table, using a stylus to dry emboss), replicate charms, perform image transfers (as in, easily apply rub-ons! ), set eyelets, smash bottlecaps, and so much more! I look forward to showing you some of the things this amazing machine can do, so please keep a watch out for tutorials I'll be showing you in the future! And to take a look at some more Spellbinders inspiration, be sure to check out the new blog roll list I added on the left sidebar of my blog, which lists all the Spellbinders designers' blogs & galleries! 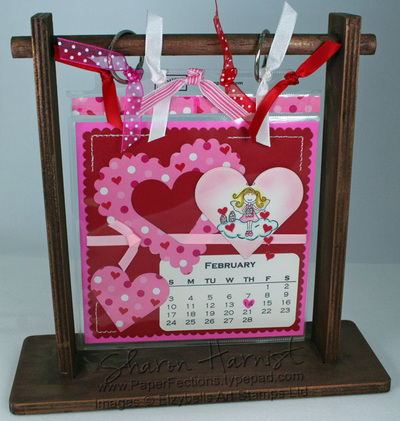 "Spellbinders has been very busy designing new products to be released at CHA-Winter 2008! 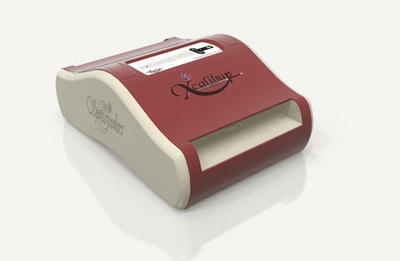 The first motorized die cutting and embossing machine, Xcalibur(TM)! Please be assured that this is not a replacement for the Wizard. The machines can share the same mats, pads and dies but Xcalibur's main features are to cut and emboss. The Wizard, Universal Craft Tool, continues to provide many additional functions such as cutting chipboard, replicating charms and transferring images, just to name a few. Be the Ruler of your Creative Kingdom!!" How cool is that?!! As stated, the Xcalibur won't replace the Wizard machine and I'll have a tutorial on how to use the Wizard tomorrow. Ask any questions you may have and I'll try my best to answer them! Keep a watch for more details in the days to come at the Spellbinders website. Price will be announced at CHA and the machine should be available around May 2008. If you are attending the CHA show Feb 10-13 in Anaheim, be sure to stop by the Spellbinders booth #5071 to check out this new machine! 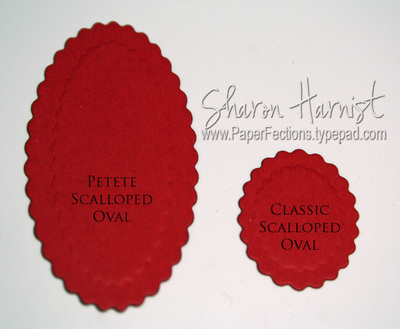 I've had several questions regarding Spellbinders Nestabilities Classic Ovals and the newest Petite Ovals, so I thought I'd show you a quick comparison. The top set of dies is the newest Petite Scalloped Ovals (large set); the bottom set is the Classic set of Scalloped Ovals (also large set). The Petite set's largest die is a tad over 4.75" wide and almost 3.75" tall. The Classic set's largest die is 4" wide and 3-1/16" tall. As you can see, the shapes are totally different and give you a wide range of flexibility for your crafting needs. But since the shapes ARE totally different, you will need each of the coordinating straight ovals to layer with them -- the Classic's straight Ovals won't layer exactly with the Petite's Scallops -- you might get an interesting look, though! Also, the Petite's scallops are smaller and there are more of them (37) vs. the Classic's scallops, which are larger and fewer of them (22). The left Petite Oval is 2-5/16" (just a bit over 2.75") top to bottom and 1-3/16" (a tad over 1.25") wide and great for a short sentiment; the right Classic Oval is 1-1/8" tall and 7/8" wide -- good for one word sentiment or a flower center! I hope this helps you in your decision-making process. If not, please feel free to email me (link is below my photo on the upper left sidebar). 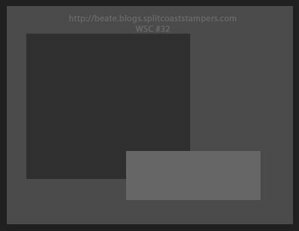 Are you a SplitcoastStampers.com member? If so, and if you are interested in providing some helpful feedback, please check out this survey. Just click on the link below to get started . . . and thank you for your time! 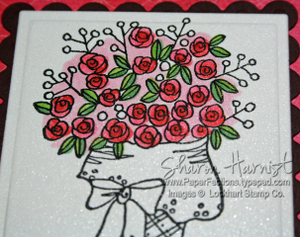 I stamped the bouquet with Brilliance Graphite Black on my favorite white shimmer cardstock and colored it with Copic Sketch markers. The image was cut with Spellbinders Nestabilities Classic Rectangles and matted with Prism Intense Pink cardstock, then a Scalloped Rectangle was cut from the same Sugar Plum (soft pink) card base. 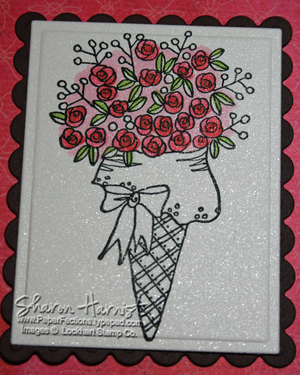 Copic Spica Glitter pens accent the roses and bow. 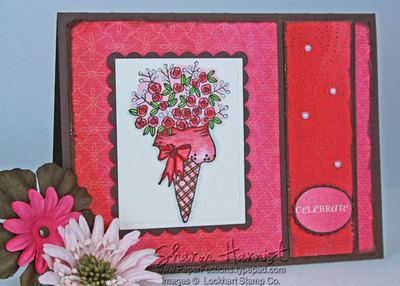 The card base is a Memory Box Sugar Plum notecard, stamped with Cornish Heritage Farms' Scalloped Lace backgrounder in Ranger's Worn Lipstick Distress Ink. I trimmed the background stamp along the bottom edge, following the scalloped lace and then placed some pink Dew Drops in the middle of every other scallop. A bit of pink crushed velvet ribbon (from Michael's) knotted and pinned finishes off this card. Be sure to check out the blogs of these wonderful stampers, to see what they came up with for this challenge: Cambria Turnbow, Charmaine Ikach, Jenn Balcer, Laurie Schmidlin, Lori Craig and MaryJo Albright. Then try it for yourself and post it on Beate's blog here -- have fun! CHF Backgrounders Now Available . . .
. . . at Ellen Hutson's store! Yes, you heard that correctly -- Ellen will be carrying Cornish Heritage Farms' wonderful backgrounder stamps that you've seen me use, so now you can do a lot of one-stop shopping with Ellen! 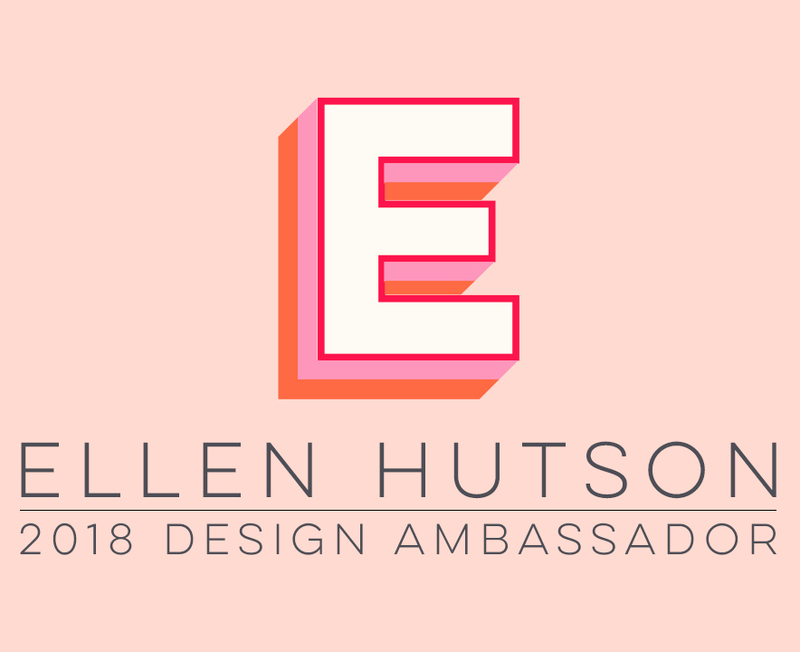 Check out Ellen's announcement on her blog and you can start browsing her online store to see what's available. You can also check the CHF Gallery on each of the newer backgrounders to see fabulous samples of their use. I'll be back a little later with those photos I promised you of all the goodies I got on my Spellbinders training trip from all the product suppliers, so check back in! It's time for another SplitcoastStampers Dirty Dozen/Alumni "reunion day" (I liked Jami's wording!). We've been getting together on the 20th of the month for a few months now and it's always fun to see what each of us comes up with, using the same parameters. 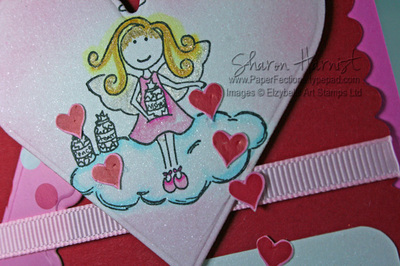 For a girl image, I used Elzybells' Peace, Dream & Wishes (those are the labels on this sweet little angel's bottles of hearts she is doling out)! The original image is stars she is scattering from her cloud, but I changed them to candy hearts for February Valentines -- does that fit the "sweet" part of the challenge?!! 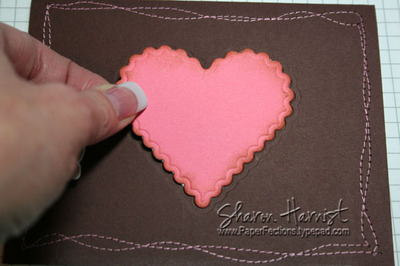 Her little hearts are cut out from the patterned paper I used here, which are notecards from the Target Dollar Spot! Lovin' that airbrush system -- I really like that soft halo effect that leaves white around her! Just touch the brush tip to the paper in one direction and then again in the other direction, for an instant perfect heart shape (yours probably won't have that darker spot at the bottom -- I was holding down my marker too long for the photo)! I faux stitched the corners of this page, using a paper piercing tool and white gel pen. 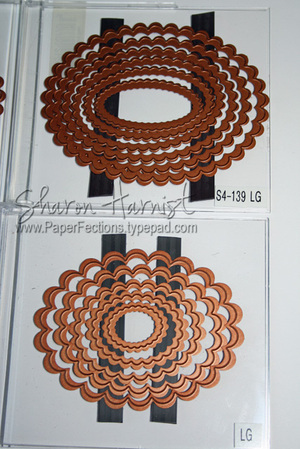 The red layer is Stampin' Up's Real Red and I scalloped the edges with Fiskars decorative scissors. The base layer is SU's Pixie Pink. 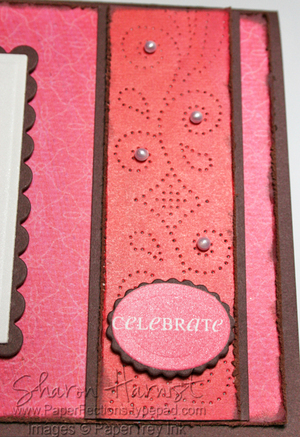 Light pink grosgrain ribbon is Stampin' Up. I can't wait to see what the other girls came up with -- you can check out all their stuff in this gallery. Enjoy your Sunday! If you don't know about these markers already, what you first need to understand is the numbering system. The first letters represent a color family: YG is for yellow-green, G for green, R for red, E for earths and so on. The last digit of the numbering system is the lightness/darkness within that color family -- this is the reason R81 is a light pink within the red spectrum and R08 is a darker red within the red family. The middle digit is the color tone or brightness/dullness, so R08 is actually on the lighter, more orange end of the red spectrum, while something like R59 is on the other end of the red spectrum, containing more red/violet tint. 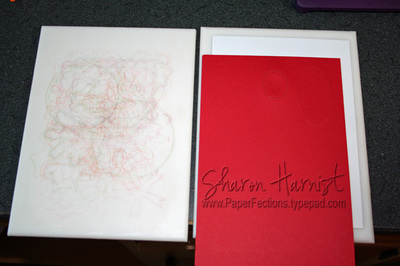 Then when you first touch the lighter marker to paper, you'll have the darker red color fading into the lighter color. You can see this shading technique a little better in the straight squiggled line . . . the swirl is how I actually colored the roses, starting in the centers where color is usually darker on a rose. 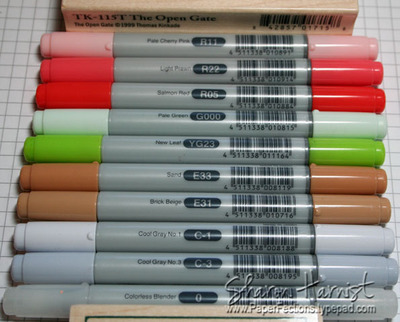 With these alcohol-based markers, you don't have any fear of ruining your lighter marker, because as you can see, the more you color & scribble with the marker, the darker color is removed from the lighter marker. The wrapper around the bouquet was colored much in the same way at the top, and then adding the #0-Colorless Blender pen towards the bottom of the wrapper and using it to lift off some of the lighter R81 Rose Pink color and fading it into almost white, to leave a lighter color of highlight. Since the green colors ending in 3 and 4 are so close within the green color family, you'll achieve a subtle but noticeable difference in the shading. I hope these tips have been helpful and I'll certainly have more of them for you in the future! Edited to Add: I've had some questions as to the ink and paper I used here . . . my apologies for not mentioning those (you all usually keep me on my toes!). My favorite non-smearing ink to use with the Copic markers is Brilliance Graphite Black or Pearlescent Chocolate by Tsukineko. Once you stamp your image, let it air dry thoroughly, or if you are the impatient type like me, zap it with your heat tool for a few seconds to dry it quicker! My favorite cardstock to use for any kind of coloring (watercolor, dye-based inks or watercolor crayons) has been a shimmery white for several years now. Stampin' Up's Shimmer White is the same (in my opinion) as Arjo Wiggins Curious Iridescent Cryogen White (available from CutCardStock.com). This manufacturer also makes a beautiful vanilla shimmer cardstock (Poison Ivory) you'll find in the highlighted link above. It is also available at PaperZone storefronts, if you happen to have one near you. I'm happy to report this coated shimmer cardstock works GREAT with the Copics and is just about the only thing I use for coloring stamped images! I accented the bow with Copic's Red Spica glitter pen and the baby's breath is Ranger's White Opal Liquid Pearls. The image was cut and matted with Spellbinders Nestabilities Classic & Scalloped Rectangles and is popped up on dimensional foam tape. 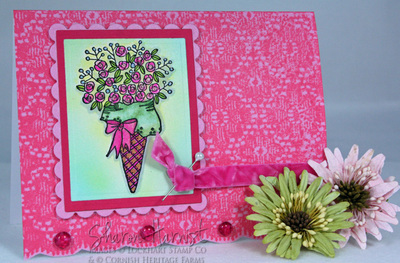 PaperTrey Ink's sentiment from Borders & Corners-Oval set was stamped in Stampin' Up's Classic Regal Rose and cut using Spellbinders Nestabilities Classic & Scalloped Ovals. It is popped up on dimensional foam tape. 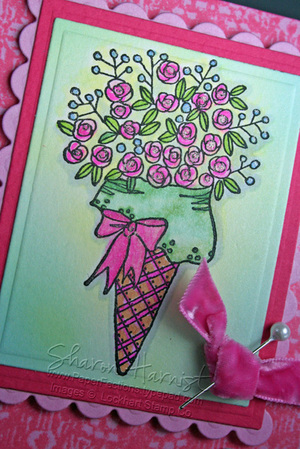 The beautiful pink pearl accents are from Ellen Hutson's store. 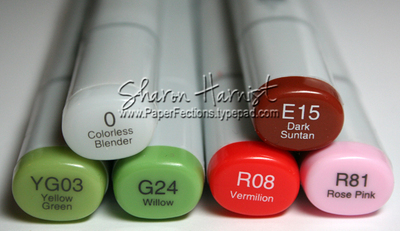 Check back in a bit for that Copic Coloring Tutorial and be sure to visit the follow blogs for some gorgeous samples of the sketch challenge: Cambria Turnbow, Charmaine Ikach, Jenn Balcer, Laurie Schmidlin, Lori Craig and MaryJo Albright . . . have fun creating this weekend! 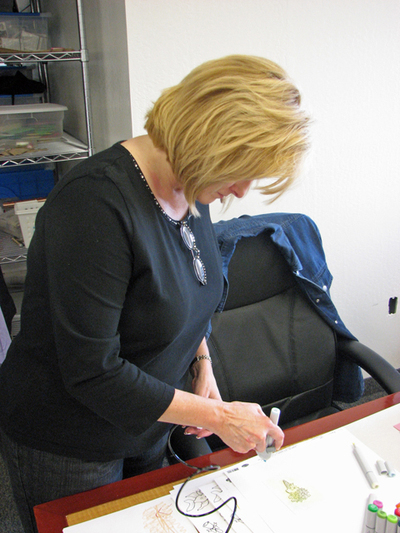 I was away the end of last week, in Phoenix at our Spellbinders design team training and what fun we had! 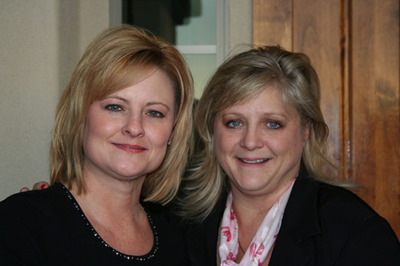 Jeff & Stacey Caron, Spellbinders owners, were the most gracious hosts and the most fabulous people you'd ever want to meet! My deepest thanks to them, once again, for inviting me into their family, for all they've done for the team so far and what I know is yet to come . 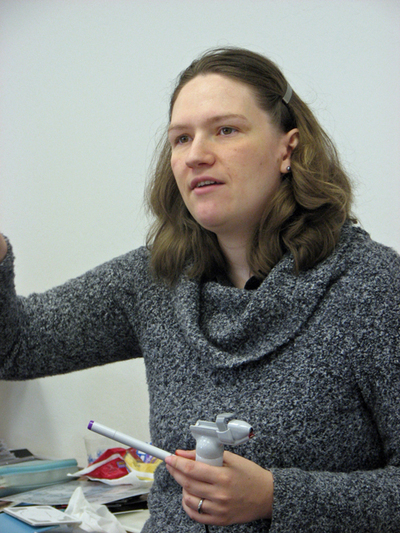 . . hang on to your seats, folks, because Spellbinders is going to be rocking the papercrafting industry this year! 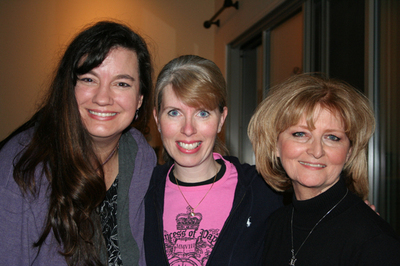 L-R: Fabulous scrapbooker, Sally Lynn MacDonald * My Paper Salon & Paper Crafts stamping idol, Jennifer Ellefson * Fellow Splitcoast Dirty Girl Alumni, Linda Duke <== Click on their names to visit their blogs. What a pleasure it was to meet Stacy (and Jeff!) -- It was amazing to see how similar our styles are, not only in stamping & papercrafting, but also in wardrobe and home decorating! I'll have to show you all later, what I came up with! On top of getting to play with all of our new toys, we are all Copic Certified Designers now!! It will be a fun year ahead, combining these wonderful tools together (Spellbinders & Copic) and I hope you all will join me in the journey! As soon as my box of goodies arrives at my house tomorrow, I'll share a photo of all the loot we got from Spellbinders and our preferred product providers . . . it will blow your mind!! Also join us tomorrow morning for Beate's weekend sketch challenge. Until then . . . Since I showed you all THIS card a few months ago with the inlaid rectangle, many of you have been asking how to make that insert that lays flat on the surface of the card, so here's the tutorial for you! 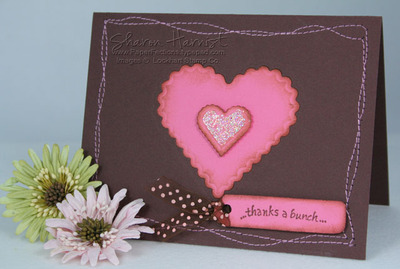 I finished the card by placing a tiny scalloped heart that had been glittered on a pop-up glue dot. 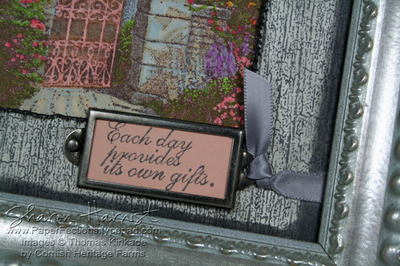 The tag was cut with Spellbinders Standard Tag (S3-028) and stamped with Karen Lockhart's new sentiment. "There was a defect in manufacturing on the Spellbinders Scalloped Hearts, the replacement hearts have been ordered and will be in the warehouse in two weeks. 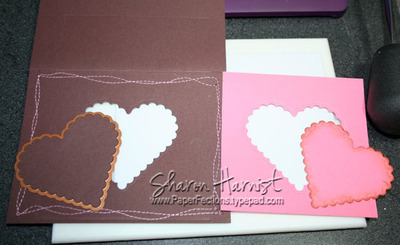 The replacement scalloped hearts will match perfectly with the straight edge hearts. Anyone that has purchased and received the original scalloped hearts will be able to replace them at no charge." Ellen Hutson's customers that purchased the Scalloped Heart Nestabilities from her can read a note from Ellen HERE. 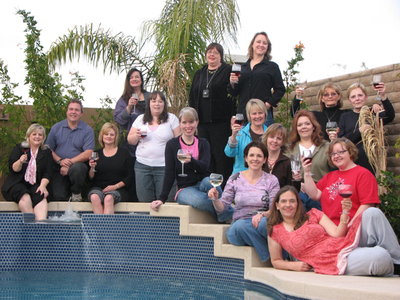 I hope to have a few things about my trip to Phoenix for Spellbinders Design Team training to share with you tomorrow . . . what a FUN time! 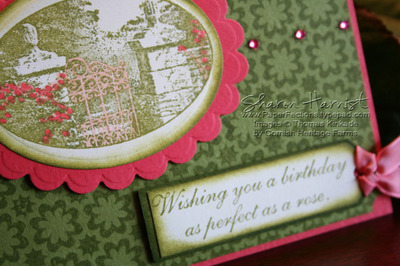 Who needs patterned paper with a backgrounder stamp as gorgeous as this! This is my favorite out of the 16 Winter releases this past November from Cornish Heritage Farms -- Geometric Flowers II. You can see all 16 of those backgrounders and beautiful samples in this CHF gallery. The corners of the background were clipped with Ticket Corner punch and mounted to a standard A2-sized card base of Prism Blush Red Medium. The focal image was masked (did not include the rectangle frame) and just the oval vignette stamped in Spanish Moss ink on Neenah Classic Cream cardstock. 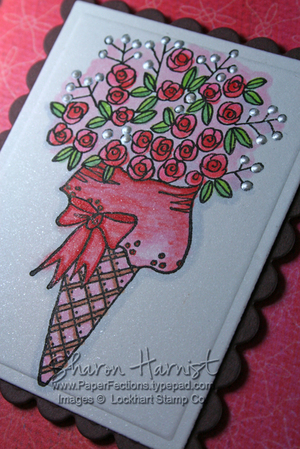 Just the roses and gate were colored with Copic markers (R11-Pale Cherry Pink & R22-Light Prawn). The image was cut with Spellbinders Nestabilities Classic Oval and matted with Scalloped Oval Nestabilities in the same Prism Blush Red Medium cardstock as the card base. This piece is popped up on foam dimensional tape. 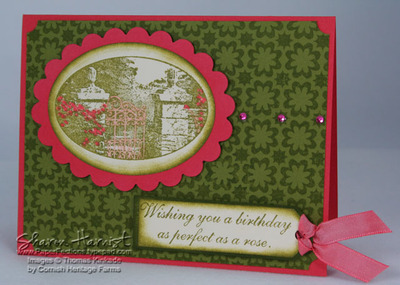 The sentiment is another new Kinkade release, "A Birthday Rose". It's stamped in Spanish Moss on Classic Cream and tag shape cut and mounted to more of the Spring Willow Medium Prism cardstock that was inked with Spanish Moss. The tag is also popped up on dimensional foam tape. The ribbon was originall white taffeta but I colored it with the Light Prawn #R22 Copic marker so it would match the roses and cardstock! A final bit of bling was added -- a row of pink twinkle stickers. All stamps by Cornish Heritage Farms: Thomas Kinkade The Open Gate Vignette & A Birthday Rose sentiment, Geometric Flowers II Backgrounder. 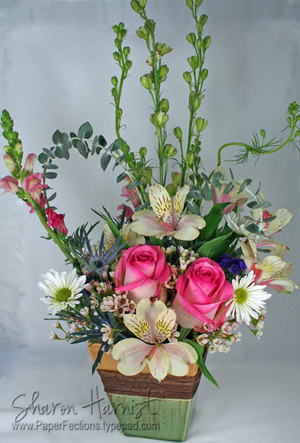 Paper: Prism Blush Red Medium & Spring Willow Medium, Neenah Classic Crest-Classic Cream. Ink: Tsukineko Versafine Spanish Moss, Copic Markers (R11-Pale Cherry Pink & R22-Light Prawn). 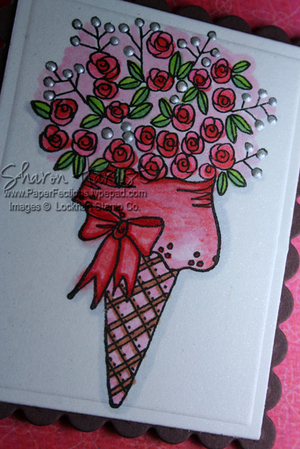 Accessories: Spellbinders Paper Arts Nestabilities Classic & Scalloped Oval embossing dies, A Muse Creative Candy Twinkle Stickers, Ticket Corner Punch, White Taffeta Ribbon (colored with R22 Copic marker, to match image roses & cardstock), foam dimensional tape. That's all of my Thomas Kinkade samples for now -- I hope you've enjoyed them! As you read this, I've actually been in training this week at Spellbinders Paper Arts for my Design Team position this year. I can't wait to share what I've learned with you! If you can't tell by now, I REALLY like stamping these Thomas Kinkade images monochromatically and black/white is my favorite combo! Plus, they make for a really quick & easy card with a lot of pop. 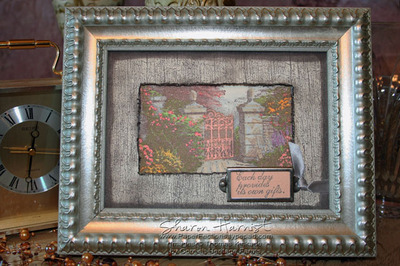 This is the vignette size of The Open Gate that I posted yesterday -- which is just a smaller section of the stamp that has been reduced in size a bit and put into an oval shape with a rectangle frame. Now, if you don't like that rectangle frame (and maybe think you'll never use it that way), then you can certainly just cut that part off your rubber stamp OR mask it before inking it. In tomorrow's sample, I just masked it off. The image was stamped in Versafine Onyx Black -- I've found the Versafine line of inks to the best at retaining all the fine details of these stamps. It is stamped onto Neenah Classic Crest-Solar White cardstock and cut with just a paper trimmer. 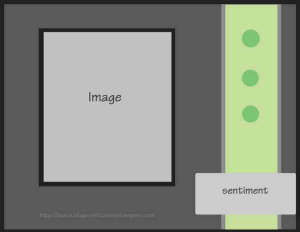 The black scalloped rectangle frame around the focal image is Spellbinders Nestabilities Scalloped Rectangles. The image is popped up on dimensional foam tape and accented with clear crystal stickers. 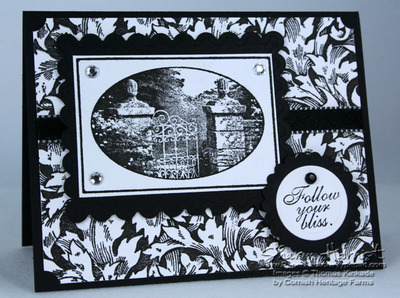 The sentiment is also a new Thomas Kinkade release and was selectively inked and stamped onto Solar White cardstock with a black marker (the original sentiment is in one line). Then the sentiment was cut out with Spellbinders Nestabilities Classic Circles and matted with a Scalloped Nestabilities Circle; it is also popped up on dimensional tape. A piece of white-edged black sating ribbon finishes off this card. 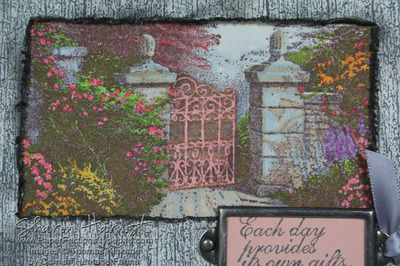 All stamps by Cornish Heritage Farms: Thomas Kinkade The Open Gate Vignette & Follow Your Bliss, SonLight Impressions Victorian Leaves backgrounder. Paper: Prism Black, Neenah Classic Crest-Solar White. Ink: Tsukineko Black Onyx. Accessories: Spellbinders Paper Arts Nestabilities Scalloped Rectangles & Classic/Scalloped Circles, Doodlebug black brad, Michael's ribbon, clear crystal stickers (unknown source), Stampin' Up/EK Success Ticket Corner punch. I've got one more sample to you show you tomorrow! 5" x 7" mat is Weathered Wood backgrounder stamped in Adirondack Slate dye ink on Neenah Clasic Cream cardstock and then more of the Slate ink sponged on the edges and randomly on the wood. 4.50" x 2.50" rectangle was cut in the center of the mat and the edges distressed & inked. All stamps by Cornish Heritage Farms: Thomas Kinkade 'The Open Gate' & 'Each Day...', SonLight Impressions Weathered Wood backgrounder. Paper: Neenah Classic Crest-Classic Cream, Prismatics Frosted Orange. Ink: Ranger Adirondack Slate dye ink, Tsukineko Versafine Vintage Sepia, Copic Markers. Accessories: WeRMemoryKeepers pewter metal bookplate, May Arts ribbon, Tonic Edge Distresser, Stamp-A-Ma-Jig, 9.25" x 7.25" silver frame. Check back in tomorrow for another Kinkade sample & Beate's Weekend Sketch Challenge!